A bus crashed into the back of a tractor trailer near the entrance of Fort Irwin National Training Center in California in June 2014, killing one and injuring several others. That tragic accident has resulted in a wrongful death lawsuit that is getting more complex by the month. The wreck occurred on June 2, 2014 at 5 am, when a Victor Valley (CA) Transit Authority Bus slammed into the rear of the big rig that did not have its emergency lights on. There were no cones placed at the rear of the truck. The family of a bus passenger who died filed the wrongful death lawsuit. Defendants include Victor Valley Transit Authority, the bus driver, two firms related to the operation of the bus, the driver of the big rig, and three companies related to the operation of the truck. The lawsuit was filed last March and has been moved to federal court. This comes after a claim filed against VVTA was denied on July 24. The lawsuit alleges that both drivers where unsafe and negligent. Both defendants deny wrongdoing, and the bus driver’s attorneys reject the plaintiff’s claim that he was speeding at the time of the wreck. Both groups of defendants have filed a cross complaint against the other, claiming the other had active liability for the wreck. Both sides also have filed third party complaints against the US government, including Fort Irwin National Training Center. The allegations state that the big rig was stopped outside the base according to Fort Irwin’s entry procedures, but that the presence of the truck parked there was dangerous. The US has denied the allegations and wants the third party claims dismissed. As the above tragic case makes clear, commercial truck and bus accidents can be exceedingly complex. The wronged party needs to be certain that they have an accomplished and experienced personal injury attorney working for them. Our truck accident lawyers in Virginia and North Carolina have worked on complicated, multi-million dollar cases that took great skill and tenacity to conclude successfully. One of our clients was rear ended by a tractor trailer in Virginia Beach. The truck was going 40 MPH when it rear ended their vehicle. The family’s two young daughters in the rear both received serious head injuries in the wreck, which the truck driver claims occurred because he fainted behind the wheel. 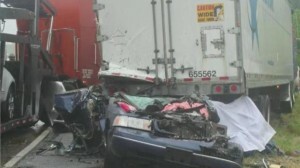 Our team showed during mediation that most likely, the truck driver fell asleep, and injured our clients for life. We were pleased to settle this serious, complex case for $21 million.